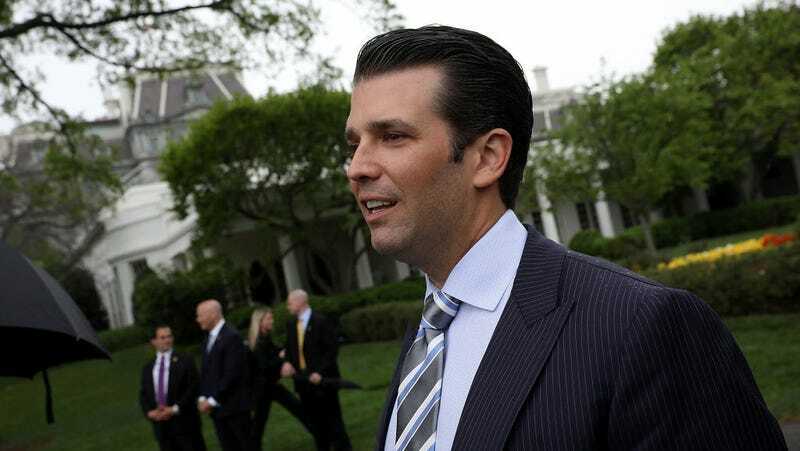 In the final months before the 2016 election, Donald Trump and his son, Donald Trump, Jr., both received an email containing a link and “decryption key” for Wikileaks files, CNN reported. The implication, of course, is that the email was another bit of evidence that the Trump campaign was secretly in cahoots with Wikileaks during the election. And that might be true! But it appears CNN got the date of the email wrong, according to the Washington Post, rendering the whole thing inconsequential. Instead of offering an unpublished preview of Wikileaks documents, the email was actually sent after the Wikileaks documents it contained had already gone live. CNN initially reported that the email arrived on September 4th—the first day that Trump Jr. tweeted about Wikileaks and Hillary Clinton’s emails. But the email actually came 10 days later, on September 14th, according to the Post, which also obtained a copy. It directed the recipients to Democratic National Committee emails posted on Wikileaks and emails hacked from Colin Powell, which were released by DC Leaks—not Wikileaks. The email was signed by someone identifying himself as Mike Erickson, but it is not clear who sent the email, which came from a Yahoo address, according to the Post. Trump Jr. told House Intelligence Committee investigators that he didn’t remember receiving the email. The message arrived after the hack of the Democratic National Committee had become public, but prior to Wikileaks’ release of Clinton campaign manager John Podesta’s emails. A few weeks after Trump Jr. received the email offering Wikileaks documents, he engaged in a conversation with the organization via Twitter DM. Wikileaks encouraged Trump Jr. to promote its documents and asked him to leak his father’s tax returns. Eventually, he broke off the correspondence.